The Government has extended the deadline to file the annual returns for FY 2017-18 under Goods and Services Tax (GST) to March 31, 2019, which earlier was December 31, 2018. All taxpayers registered under the GST act between July 2017 to March 2018, have to submit the annual return in form GSTR 9 (for the regular taxpayer) or GSTR 9A (for composite taxpayers). The taxpayers with a turnover of more than Rs. 2 crore in the Financial Year(FY) 2017-18 will have to get their books of accounts audited under GST provisions by a CA/CMA and must submit a reconciliation statement in form GSTR-9C, certified by a CA/CMA along with the annual return. Compliance with the GST provisions is a must-do task by you, as a registered taxpayer. Otherwise, you will end up paying penalty and late fees. You should keep all the details handy to avoid the last minute rush for filing annual returns. Now, let’s discuss the five things you need to do before you submit the annual returns for FY 2017-18.
a. List of all tax invoices and reconciliation thereof: Firstly, you should be ready with the list of all the tax invoices issued during the period July 2017 to March 2018. It would be best if you segregate the tax invoices GSTIN-wise and make sure that the sum of the value of all the tax invoices matches with the turnover in the audited financial statements. It is possible that you could have revised some invoices of the FY 2017-18 in the period from July 2017 to September 2018. Those invoices have to be properly verified and then reported in the annual return. Any discrepancy in the invoices might lead to non-reporting or incorrect reporting to the GST authorities. In addition to this, care has to be taken in considering those transactions that have not been accounted in the books but subject to GST like the transfer of stocks between units units of the same company free of cost. b. GST Audit: If your turnover has exceeded Rs. 2 crore in the FY 2017-18, you are subjected to GST audit. If you have not initiated the GST audit yet, then you should get it done right away as in such cases, the annual returns are to be annexed with a certified reconciliation statement in GSTR 9C and the audited financial statements. GST audit shall cover an entire range of transactions undertaken during the year and therefore will be very crucial for the identification of inconsistencies and taking timely corrective actions so as to reduce anticipated litigation, wherever possible. 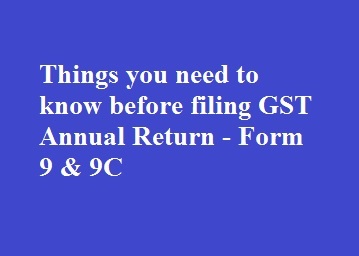 c. Prepare to file two annual returns, if applicable: Earlier, if you had opted for the composition scheme under GST and then switched to become a ‘Regular Taxpayer’, then you will have to file two annual returns i.e. GSTR 9 & GSTR 9A for the respective periods by the designated due date. For example, if you were registered as a composite taxpayer for the months starting from July 2017 to October 2017 and as a normal taxpayer from November 2017 to March 2018, then you will have to file GSTR 9A for the months of July 2017 to October 2017 and GSTR 9 for the month of November 2017 to March 2018. If this happened last year, then buckle yourself up and keep all the details ready for GSTR 9 & 9A. While reporting, ensure that you do not duplicate the entries in both the returns. 1. List of HSN for all the inward supplies: The list of HSN codes of all the inward supplies of the FY 2017-18 should be kept handy; this is an additional requirement in the annual return whereas the periodic returns like GSTR 3B never asked for these details. You, as a taxpayer, should identify and extract the HSN wise summary from the purchase register at the earliest to file error-free annual returns. This requirement may take a while for those who have not maintained the HSN wise purchases during the FY 2017-18. If you haven’t accounted for it, you have ample time to identify and record this in your purchase register and file your annual return with ease. 2. Segregation of ITC claimed: The ITC claimed in GSTR-3B must be bifurcated as inputs, input services and capital goods for the reporting purposes. This was never a requirement in the GSTR-3B filed. A proper system of accounting for each transaction as capital goods, services and goods will help. You should be very careful while reporting the ITC claimed and also remember that you will not be able to claim any unutilised ITC and reverse any ITC claimed in annual return. e. List of all amendment entries and reconciliation thereof: Lastly, list of all the amendments entries made in the periodic GST returns of FY 2018-19 relating to the invoices raised in FY 2017-18 should be prepared. Ensure that the summary of all the amendment entries of FY 2017-18 reported in the periodic returns of month April'18 to Sep'18 by 25 October 2018 is available at hand. Collating all the information required for filing GST annual returns in one place is a very time-consuming task. It would be better for you to start with the process of reconciliation and GST audit if applicable, at the earliest. A taxpayer must be ready with the audited financial reports for each registration to avoid any consequences of incorrect annual return. There is no provision to revise the annual return so far. Hence, by taking note of these points, you can ensure filing of error-free annual returns. The government plans to create a backstop facility for states to receive GST compensation for three additional years after the expiry of the first five years as mandated by the Constitution. The Union government plans to create a backstop facility for states to receive compensation for three additional years to implement the nationwide goods and services tax (GST) after the expiry of the first five years as mandated by the Constitution. This is aimed at ensuring that states grappling with a revenue shortfall after the implementation of the GST regime do not face a sudden fiscal shock when the five-year transition period ends in 2022. The backstop facility would help continue compensation through an annual transfer of the centre’s tax revenue to the states, for which the 15th Finance Commission would prepare a blueprint, two officials said. The recommendation will help states get the GST compensation till 2025, when this finance commission’s term ends. Assured compensation helps in decision-making by consensus within the apex indirect tax decision-making body, the GST Council, where neither the centre nor the states can get decisions passed without the support of the other, according to the Union government. So far, all decisions—including GST rate cuts—have been taken by consensus, as states are confident of a 14% annual revenue growth, supported by the GST compensation.